投稿日 : 2016/01/26	| カテゴリー : 4.What to do in Tokyo? I introduce SAKURA(Cherry Blossoms) at Ueno Park.This photo shows SAKURA at Ueno Park.Ueno Park is the　famous place where you can see SAKURA at Ueno. Since the cherry blossom season lasts only for a week,if you come to japan between the end of March and the beginning April, please come to this place and enjoy SAKURA viewing. Enjoy a brief viewing of Cherry Blossoms! at Ueno. List of Hanami site in Japan. 1.Enjoy a brief viewing of Cherry Blossoms! at Ueno. This You Tube shows SAKURA at Ueno Park in Tokyo. 2012/4/10.Beautiful cherry blossoms and lots of Japanese people enjoying hanami at Ueno Park in Tokyo, Japan. Ueno Park is a large public park in central Tokyo. The National Museum for Western Art, the Tokyo Metropolitan Art Museum and the National Science Museum. The Park features more than 1000 cherry blossom trees along the street around Shinobazu Pond. 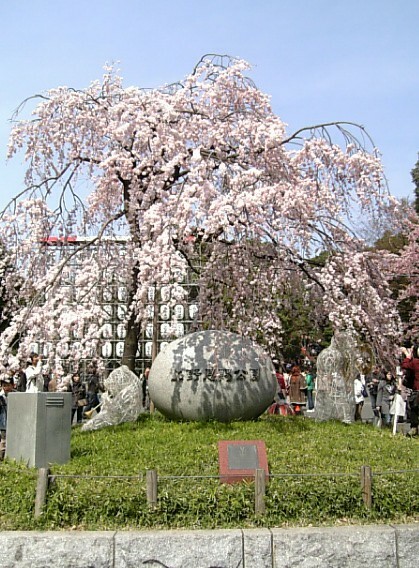 Ueno Park is one of Japan’s most crowded, noisy and popular cherry blossom spots. About 1300 lanterns light up to extend hanami into the moonlit sky. Use of Keisei Narita Sky Access Exp. HypirDiya is Transfer Information Site. “HyperDia” is a service which offers the route and the timetable of the railway and the aviation of Japan. With simple operation, “HyperDia” guides the optimal route and the fare from starting point to end. 3.List of Hanami site in Japan. I want to let you know about these websites where you can find so much information on Hanami in Tokyo.The good news is that you can read some of these websites in English.I think this will be helpful when you want to find a Hanami in Tokyo.If you are visiting Japan, please use these sites. 桜 開花予想 2016(only in Japanese): forecast of flowering time　of sakura 2016. お天気　Japan 桜の開花・お花見情報(only in Japanese):Flowering information of Sakura　in Japan. Art museums in japan ×26.